Well, we’ve had funny videos, and we’ve had extreme adventure videos, now we’ve got one that will make you think. Every 1 in 1 people die and yet, at least in the west, death is a taboo. 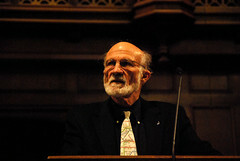 In today’s video Stanley Hauerwas talks to the Centre for Public Christianity very candidly about death and dying well. Prepare to be challenged as you watch this interview. After you watch it I would love to hear your thoughts, did anything stand out for you?